The bed swaps between bed and day-lounger mode easily. Tilford upholstery adds a quality feel. 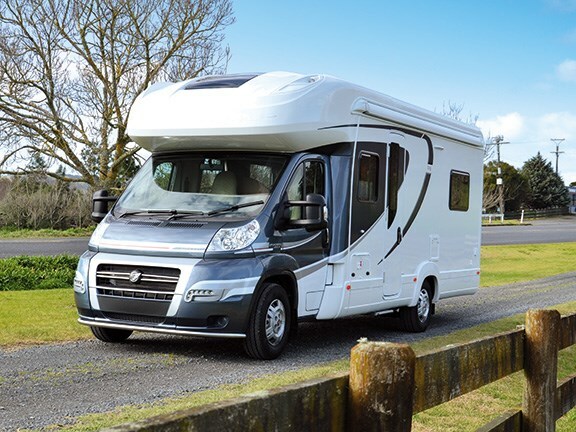 UK motorhome builder Auto Trail scored an immediate success with the release of its Tracker range in 2012. So it's unsurprising that this year's Auto Trail Tracker RB has enjoyed only minor upgrades. The Tracker range comprises four models – the RS, EKS, FB and the RB. Our review vehicle is the RB (rear bed), and at 7.6m it's the longest of the four. It's an attractive, luxuriously-appointed motorhome and the eye-catching Tilford upholstery projects its 'unique' status the moment you step inside. Warm and homely, the RB's perfect for couples who savour stylish living. It's also suitable for a small family. You'll have to be a bit of a sleuth to pick up the changes to the new model. They include a stainless steel 'nudge' bar fitted to the front spoiler, LED tail lights and an upgraded GPS/7" touch-screen multimedia unit in the dash. The nudge bar's an unobtrusive but sensible addition – it helps to protect the spoiler and offers some peace of mind if (when) you decide to leave the road and drive through untamed bush. 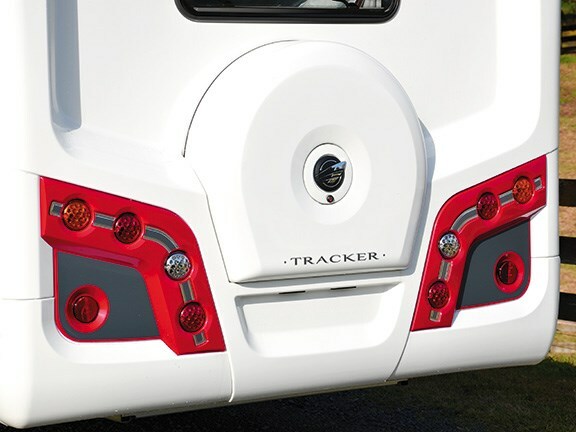 If anything the LEDs enhance the Auto Trail's already distinctive tail lights. It's not all cosmetic though – they also offer easier maintenance because they'll last longer than conventional, incandescent bulbs. Learning to operate the new multimedia unit will provide hours of fun for the technologically-challenged. In addition to GPS it's a radio/CD/DVD player with Bluetooth connectivity and contains a SD card reader as well as an AUX/MP3 input. It also serves as the screen for the infrared reversing camera. DVDs play through a fold-down, 15inch flat-screen built into the cab's ceiling. The entire Tracker range is available in three versions – Hi-Line, Lo-line and Super Lo-line – with different aerodynamic profiles. 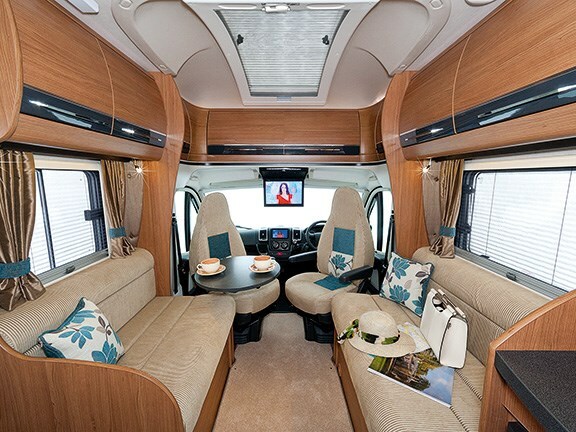 Ours is the Lo-line, and it presents a relatively seamless transition between cab and motorhome body. The angle of the cab's rake extends to the coach build – a streamlining that delivers frugal fuel consumption. All models ride on the same, front-wheel drive Fiat Ducato chassis – always a pleasure to drive. Our Tracker is fitted with a 2.3-litre, 150hp turbo-charged engine, and the ultra-smooth, six-speed Comfortmatic automatic transmission. This combination provides plenty of torque, and moves the RB's 4250kg mass along without fuss. The motorhome has a 770kg payload. Ease of driving is enhanced by excellent visibility. 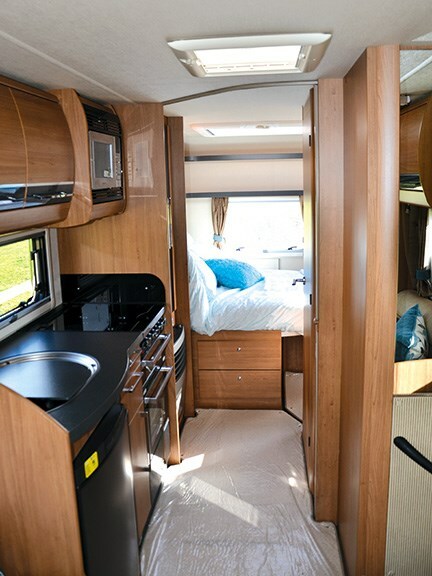 The RB has a rear window and, together with the large side mirrors and reversing camera, coaxing the motorhome into a cosy spot is relatively simple. The best part of the driving experience is the large, curved skylight in the roof – it reinforces the sense of freedom. ABS braking, cruise control and an infinitely-adjustable seat help you relax. For me, the best part of the RB is its queen-sized island bed (east-west) in the rear; a clever bit of engineering that sees the bed switched between sleep and day-lounger modes in a flash. The bed's base is hinged, allowing the head section to tilt up on a sliding ratchet mechanism. For sleeping, you simply tug on the end of the bed and it folds flat into its full dimensions (1.3m x 1.9m). As an island bed, it provides easy access for both partners and it's also easy to make up. The bathroom (further forward on the nearside) is fairly compact but very stylish, and is divided between the toilet and a separate shower cubicle. I like the decent-sized mirror with its LED back lighting, as well the shower's curved acrylic doors – good space-saving design. The RB's fitted with a 6kW Truma two-way gas/electric heater, and as it's also ducted into the bathroom you'll be able to use the space as a drying room. Opposite is the kitchen – again, quite compact but perfectly serviceable for a small family's needs. It's equipped with a 96-litre, three-way fridge/freezer, an 800W microwave and a four-plate cooker (three gas, one electric). Bench space is modest but there's excellent storage below and above. 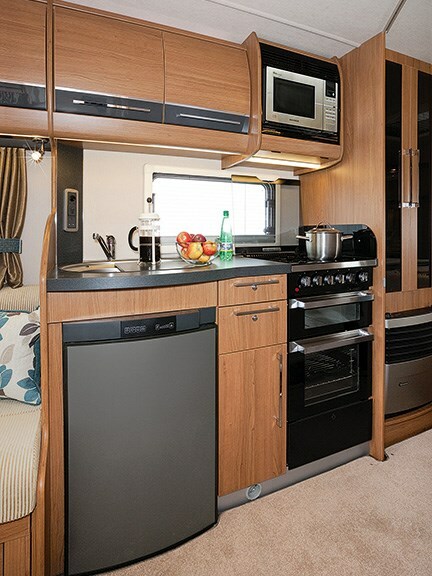 The drawers reflect the quality of the Auto Trail build – they run on roller balls – solid and smooth, and the subtle, recessed LED lighting is particularly effective around the kitchen. Meals are easily transferred to the dinette immediately alongside, with its two facing bench settees. Depending on the size of the party, you use the dinette in one of two configurations – the fixed, small round table mounted on a swing-out pedestal, or the larger free-standing table. For larger groups you'll want to include the cab's swivelling seats in the seating plan. The dinette's two settees convert into a second bed (transverse) – and like the rear bed, it's a quick, fuss-free operation. Standard Trackers – as distributed in the UK – aren't ideal for lengthy New Zealand adventures because they have limited water and battery capacity. 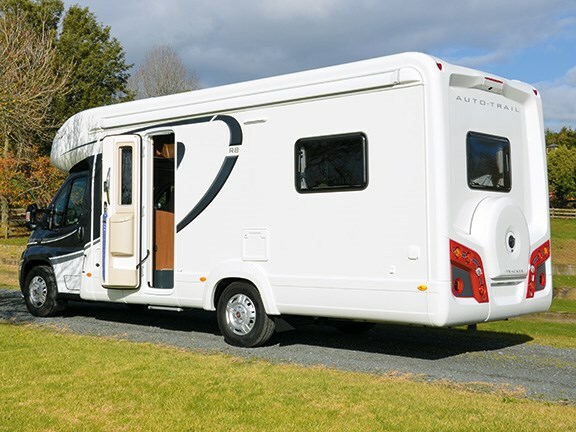 The local agent (Auckland Motorhomes) rectifies this shortfall by installing two 120 amp-hour batteries (240 amp-hours should get you through most off-the-beaten-track touring). Similarly, the grey water tank has been upgraded from 85 to 140 litres (same as the fresh water tank), so you won't require pit stops quite as often. The Tracker's also nicely set up for alfresco living/dining. That free-standing dinette table is perfect for candle-lit dinners under the stars – though you'll probably want to be sitting under the motorhome's four-metre, recessed awning. Dinner can be prepared on the BBQ (there's an external gas point), and if you're really grubby after a long hike, wash off under the exterior hot and cold shower unit before climbing into the vehicle. There's much to like about the new Tracker and very little to grizzle about – a 96-litre fridge is modest and may compromise your stock of fresh supplies on extended adventures. This doesn't seem to have dissuaded buyers though – the popularity of the marque is clearly reflected in New Zealand's Auto Trail Club which now boasts 57 members following it establishment last year. 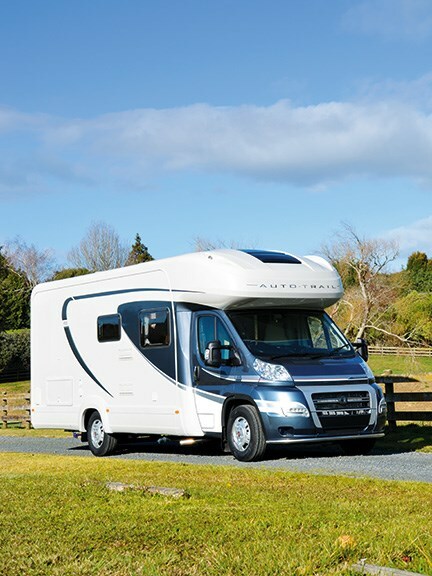 If you're an Auto Trail owner and are not yet part of the family, call Auckland Motorhomes for details (09 294 6500).